One of the toughest parts of writing is fitting yourself into the teeny mind of your characters. While you get to spend days/weeks searching through the lives of your characters, the reader may only have hours to experience the depth of a character. 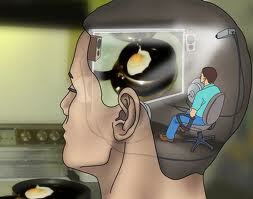 What happens in your head...spills out in the paper in the mind of the writer. So, the most daunting task is creating that character to encompass the full extent of their worth to their own story. I’m not talking about the characters that pop in and out of a scene. I’m referring to the main character: the one whose story the author is telling. As a new, determined writer to the field, I’m incredibly aware of the things I don’t know. Although they tell me to write what I do know, I find myself learning more about the things I’m writing than I knew before. For instance, it is common knowledge that we take reality and place bits if not large portions into fiction (all of it if you’re non-fiction). It is also true that many writers find comfort in writing characters in the image of themselves. (How many books have you read of Stephen King’s that feature a writer/teacher struggling with drugs/alcohol? Too many to count!) My stories have already featured the many versions of myself I wish existed and the ones I fear could exist in parallel universes. It may seem simple to get inside your own head to make a character from yourself. The truth is that the hardest character to get inside the head of is your own. I know finding my place in the world is one difficult task, but finding yourself in situations that may never occur are the most unpredictable to write even when you know who you are. What’s even more difficult for a writer is deciding how to put a character’s thoughts on the page. It may seem like a simple style decision. It could end up cluttering up your paragraphs. I made my first big decision, in the short beginning of my career, to make all of my characters’ thoughts in italics. I haven’t planned out the specifics (whether to note the thoughts with: I wonder or she thinks) just yet. However, the path is clear for me. It makes my life so much easier to know I don’t have to worry about quotes in the right place or even phrasing if I don’t want. The best part about the decision to go TEAM ITALICS is that it is a popular style of writing thoughts for about the past 50 years. It’s safe to say with this decision made, I’ll at least have some room between my lines for agents, editors, and publishers to see the worth in my writing. How do you write character’s thoughts? Italics? Underline? Quotes? Which way do you think is easiest for the reader? What way do you think the future of writing is going? Make sure you check out “Somewhere: Part 3” in my Fiction-Read and React section! It’s definitely worth a read.